Cue the Jaws music because Shark Week is here! Sharks are the ocean’s top predators, thanks in most part to their enormous and powerful chompers. 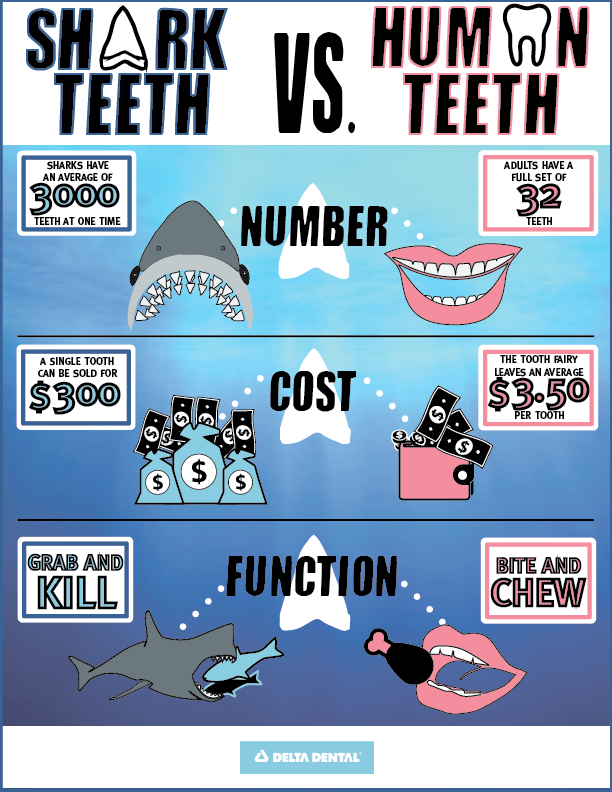 It’s obvious that shark’s teeth are different from our teeth…but just how different? These unbelievable shark teeth facts will give you something to chew on. Sharks are born with teeth. Our first teeth form in the gums before birth and begin erupting at about 6 months of age. Unlike humans, shark pups enter the world sporting a full set of teeth. This makes it easy for them to feed and fend for themselves, since there is no parental care. Sharks have thousands of teeth. Our complete set of 20 temporary teeth is usually in place by age 2 or 3. By around age 18, we have our complete adult set of 32 teeth. Most sharks have 5 rows of teeth and can have as many as 3,000 teeth at once! It’s a good thing sharks never run out of teeth, as they lose up to 100 per day. Shark teeth fix themselves. The tooth is the only part of the human body that can’t repair itself. With the exception of our baby teeth, a lost permanent tooth is unable to be replaced naturally. Sharks are luckier than us. If one of their teeth falls out, another spins forward from their rows and rows of backup teeth. In fact, a shark may grow and use more than 20,000 teeth in its lifetime! Sharks kill their prey, then swallow it whole. While we use our teeth to bite, chew, and grind food, sharks use their teeth to grab, hold, and rip prey. Once a shark has grabbed its prey, the shark swallows it whole. It may not sound polite, but for sharks, it gets the job done. If the Tooth Fairy visited sharks, they would all be rich. According to Delta Dental’s Original Tooth Fairy Poll®, the average price of a human tooth is $3.50. Imagine how rich we’d all be if we had shark teeth! Shark teeth are more than teeth — they’re fossils. The teeth of a megalodon (a giant prehistoric shark) are always in high demand and are considered the most valuable of shark teeth. A single tooth is worth an average of $300! Shark teeth have built-in toothpaste. It’s no wonder sharks don’t get cavities — the surface of their teeth contains 100% fluoride! The teeth of humans and other mammals contain hydroxyapatite, which is an inorganic constituent also found in bone. It is important to note, however, that sharks don’t eat sugar.